Google Tag Manager has a learning curve. We’ve all gone through it. The developer guide as well as the new and improved help center are very useful, but they do not answer all the questions a thorough implementation project might face. There are many ways to find answers to your questions, and I thought I’d go through some of my favorite options here. 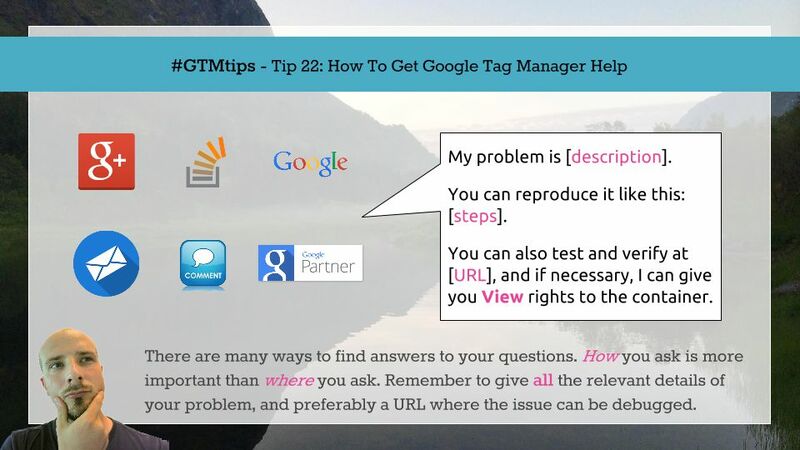 Tip 22: Get GTM Assistance To help you in getting help with GTM, there are two things we’ll need to go over: where to look for help, and how to ask for assistance.